Well, being that the world is going to end in a few days, I figure I should say something. Other than I'm bringing the stuff to make s'mores on Friday. :-) Or at least some marshmallows for toasting. Mmmm. Toast. I enjoy toast. What really pisses me off is I spent like 9 hours shopping last Saturday for Christmas gifts that I won't be able to give or return. Stupid End of the World. Could have at least waited a few days beyond Xmas, you know? Or have been a month ago. But NOooooo. I've not had enough coffee yet today. If anyone knows what time the apocalypse is taking place, please let me know. I don't want to be late. Alrighty, either the world is ending this week, or it's not and the holidays are in full swing. Either way, I'm a busy/dead girl and probably won't have much to say until the new year. Between now and New Years I have shopping and parties and such to get to - as I know you all do too. Or I will be a crispy critter and won't have anything to say/do. But text/call/email and let me know how you and yours are doing. *Before the apocalypse, please* Undead to undead calls are very expensive! Ok, this actually had me in tears. I don't know a single person who cannot relate to the crazy of predictive text. For example, last night Boyfriend made an attempt at turning something I said into something racy but instead it came out that he wants to be actively involved in my own decomposition. I couldn't help but read through - totally hysterical. It makes me thankful I don't text my mother or any other family member regularly. 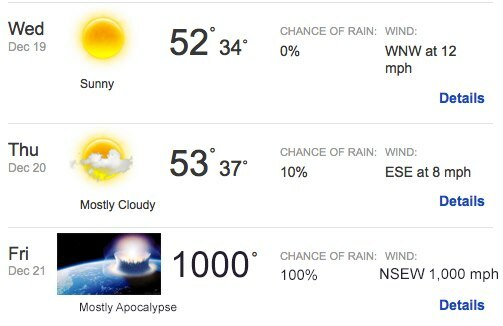 I figure we should all have a good laugh before the world ends on Friday. Enjoy! Your beliefs don't make you a better person, your behavior does....I saw this quote on Facebook the other day, posted by a good friend. Someone who went from being a staunch Christian to ultimately become an agnostic who is outspoken against hatred, intolerance and ignorance. I think it was an interesting journey for him and one of these days, when we're in person, I'll ask him about it - unfortunately, he lives a bit of a distance away now. I've often been asked about how it is that I have morality without having religion. Unfortunately, I don't have an answer, but I find it intriguing that people need the threat of supreme judgement to do the right thing. I can, of course, attribute my behavior to my family but they're equally as heathenish as I am and probably even more moralistic. I've discovered that I am a secular humanist. But that doesn't tell me why. I think that it comes down to reward - I feel good when the right thing is done and I feel badly when the wrong thing is done. But again, it still begs the question, why? Part of me thinks it is empathy. The ability to imagine what someone else is feeling. But I'm still not sure that that's enough of an answer for the question. Too bad my ADD riddled brain was on this tangent and then was yanked into the world of helper monkeys, PCI compliance, facebook, and holiday planning with Boyfriend. Damnit. I'll need to revisit this later. If there's enough interest, I'd like to start a Kiva Lending Team to make a bigger impact. Shoot me an email or a text if you'd like to participate. So I'm always looking for little ways to make some kind of contribution to worthy causes every month - especially in the course of every day life. It's not like I'm rolling in money anyway, so when I find something like this, it's really awesome. As I'm sure you know, I play World of Warcraft with my Grasshopper (aka Hopper, RyGuy, etc.). And being that it was his birthday recently, I wanted to get him a little something because I am thankful for the day his smartass was born and I can only one day hope to have a kiddo of my own just like him. Anyway, because Blizzard is awesome, they offered an in-game item that not only applies to his account BUT the proceeds are donated to the Red Cross. How cool is that? I love stuff like that. "Some people can stay in your heart but not in your life..."
So, I'm on a bit of a reminiscing kick. Thinking about those who take up space in my heart but are not active in my life for so many reasons, from death to distance to differences. It's funny, I want to reach out to them, just to know how they are, just to know they are doing ok and find out what they're up to these days. But, it's simply not possible - for some, I wouldn't even know how to find many of them, it's been so long. For others, it would possibly cause them pain that they do not deserve, nor want. My reaching out would be purely selfish, just a quick call for me but unleashing demons that are best left caged in distant memories for others. Given that I won't make the first move, I play a little game - imagining that their lives are everything they wanted or at least the good things that I wanted for them. I don't know that it's true for any of them but I like to think that it is. That these people who once influenced or were once influenced, are happy and healthy and leading wonderful lives. That when our paths crossed and then diverged, we managed to leave each other better people. It must sound silly but I don't care. I do wish everyone peace, love and happiness - those in my life, those who are no longer a part of it and those who have never been. So, to those MIA, know this - you're in my heart, always and if you'd like to get reacquainted, I'd be more than happy to accommodate. Since seemingly I have no idea what a boyfriend gift is supposed to constitute, and therefore cannot even wager a guess, I've resorted to wheedling. He won't tell me what he got for me but whatever it is, apparently, requires an audience. So I'm thinking he either got me a circus bear or a stripper pole. Did you all get your shopping done? I still have much more to go. *sigh* It's seemingly endless. I hate my blood. Most days, I try not to think about it. I try to avoid fixating on those wicked, misbehaving little cells streaming through my veins. After a week of feeling weird, I went to the doctor after work. Sitting by the door in the little waiting room, I played with my phone and texted randomly until my name was called, feeling chilled. Winters fingers have been caressing the nights, frosting breath in air. My temperature was a little high but no swollen glands, no sore throat, no coughing. So, as usual, they went after my blood. Putting the cuff around my arm they went to get my blood pressure - which is usually really really good. This week, however, I hardly have any at all, lol. 90/60...This explains all the lightheadedness, apparently. Then jabbing me with a butterfly needle and drawing lots of little vials, ready to be rushed off to various labs for processing. Again, no real answers. The only thing they ruled out was pregnancy. Great. So the one normal thing that would at least make some sense wasn't what was happening to my body. Sometimes, I think I'd like to just replace all of my blood with something else. Something not so confusing, not so esoteric. Apple cider. Or a nice Indian beer. Something sparkly and bubbly.